A Soul in Exile: Herath Mubarakh!!! Wishing all "Herath Mubarakh"....a very very Happy Shivratri. Shivratri known as Herath is the most important festival in the Kashmiri Pandit calendar. The festivities begin well at start of Phalgun krishnapakh - and go on through the fortnight, each day having a significance and events related to it. Gor'e trey, Hur-ashtami, doonye daham, etc being prominent one's other than the Herath day itself. Herath is celebrated by Kashmiri Pandits on the night of thirteenth day of Phalgun krishnapaksh - a day ahead of when Shivratri is normally celebrated by other sections of Hindus. Herath is a day when fasting, prayers to the Vatuk-raaz'e are offered and the next day (fourteenth day of Krishnapakh Phalgun) is observed as a day of celebration and feasting. Kashmiri's celebrate Shivratri differently from the other sections of Hindus - and not as the day Lord Shiv and Parvati married. Instead, the focus is on pooja of "Vatuk Bairav" and involves elaborate pooja done after sunset and goes well into the night. 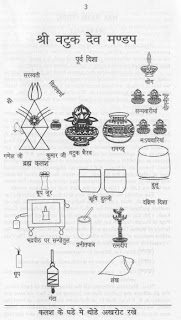 The picture on the left side shows the decorative layout of the pooja place - Vatuk being the prime deity. There are lots of customs and traditions related to Herath which may vary from family to family on this day. Of course, it doesn't snow anymore in the refugee camps in Jammu and Delhi - when Kashmiri Pandits celebrate Herath today, while in exile. No wonder none of our prayers are getting accepted either. Hope you had a good shivratri! Wishing all my community Herath Mubarak! May all our wishes be fulfilled. May we emerge gracious out of all ordeals and stay as a kosher community together.